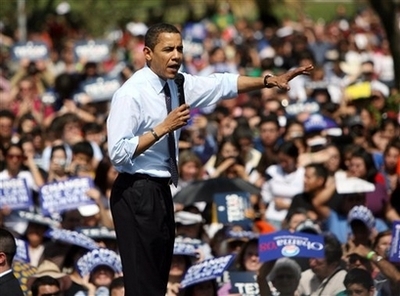 I'm sure Jonah Goldberg thinks this photo proves that like Hitler, Obama knows how to work the crowds. Hilzoy at Obsidian Wings has a great post today highlighting Obama's notable accomplishments as Illinois State Senator and US Senator. He may not have written much legislation, but I see two key facts emerge from his record. First, he seems committed to a short list of issues, such as ethics reform, prohibiting no-bid contracts, improving health care for veterans, halting nuclear proliferation, supporting human rights, technology, and dramatically improving government transparency. He actually wants the Senate to list all upcoming votes on the Internet, which would make it more difficult to sneak wasteful spending past the public. He wants a vastly improved, seamless Federal Intranet (why didn't CEO Bush think of that?). He has already built a database that tracks government contracts spending for all to see (who knew?). I knew none of this until I read Hilzoy's post, and I am all for it. Second, when he does concentrate on an issue or bill, he has a track record of winning votes from the other side of the isle. In one of the most remarkable state government achievements in recent memory, he got the Illinois state senate to approve a bill requiring every police interrogation to be videotaped. The bill passed 35-0. How 'bout that? He got every Republican in his chamber to support a human rights law. Some may look at that and think, 'he must be Jeebus!' I look at that and think, 'maybe this guy will be an excellent President.' Maybe. Katherine at Obsidian Wings has gotten aboard the bandwagon, too. When you see where Obama stands on human rights, he is closer to the young Hillary than today's Hillary.